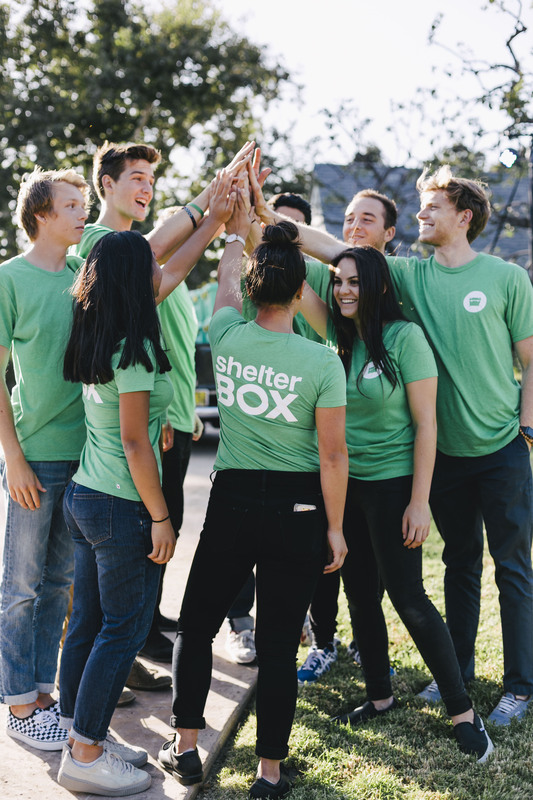 Take the challenge and go Off The Grid for ShelterBox! Take part in Off the Grid and see how you cope with no power for 24 hours: that means no phones, no laptops, no lights, and no social media. You’ll raise awareness about families in crisis after disaster strikes. You’ll also get a small glimpse of what life is like for those who have lost everything as a result of natural and man-made disaster. Sign up to go Off The Grid below. 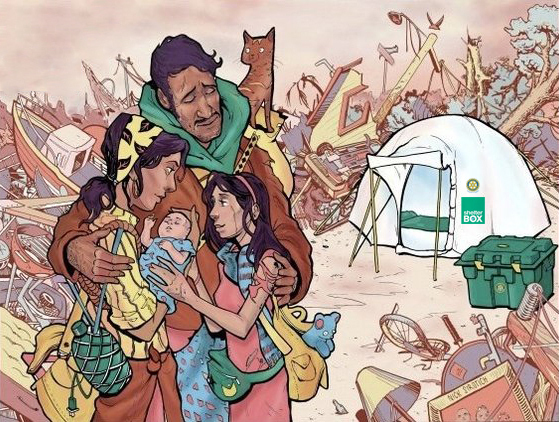 ShelterBox hand-delivers emergency shelter and tools for families robbed of their homes by natural disasters and conflict all over the world. The awareness you raise by taking the Off the Grid challenge will make a real difference to families in crisis. Plus, any money raised will directly support our humanitarian efforts. Tents, ShelterKits, cooking equipment, solar lights, hammers, rope and water filterss are just some of the things your donations can provide. You are never powerless to help – so thank you for taking part, for rising to the challenge and for supporting families in desperate need. With your help we can build a world where no family goes without shelter when disaster strikes. The Off the Grid challenge is a friendly competition to draw awareness about families left without shelter after disasters. Off the Grid challenges you to go without power for 24 hours to understand some of the impacts of disasters on families around the world. The challenge can be accepted by individuals, classes, clubs or entire schools and companies! Get your squad together, pick a 24 hour period and sign up below. No electricity and nothing with an ‘on’ button for 24 hours. How far you take the challenge is up to you, the bigger the challenge, the more people that sponsor you, the more you will be helping people in crisis – who have no shelter, no home and no access to any power. Why are you choosing to go Off The Grid? What are you planning to do while Off The Grid? Harness the power of the internet! 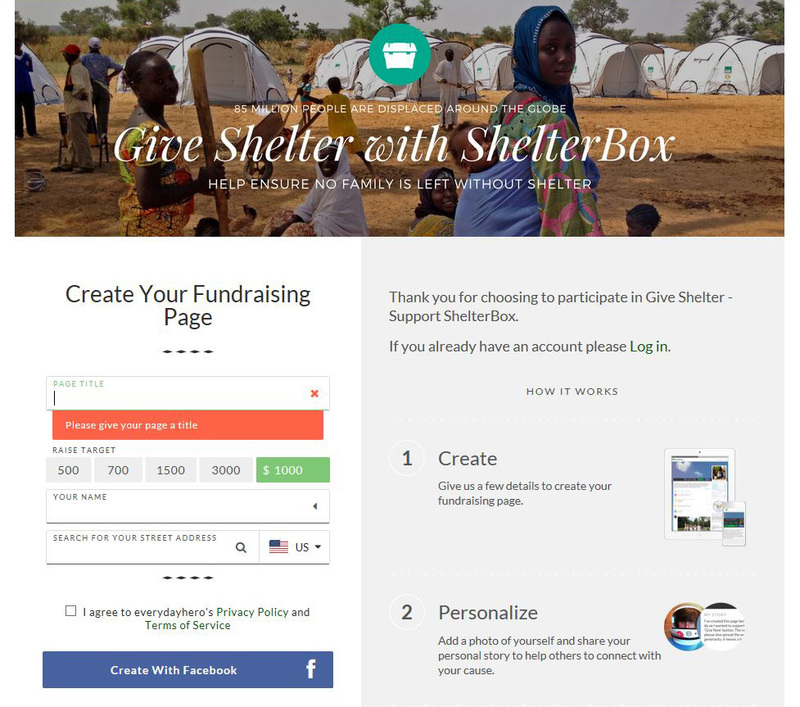 Create an online page which allows you to do your own ShelterBox fundraising. Set a goal for your Off The Grid campaign and easily tell your story via email or social media. We make it easy to connect with your community and track your own progress. Tasty food ideas to help keep you fueled up while Off The Grid! In a medium cast iron saucepan, crisp up the english muffins with a bit of butter until golden and crispy. Set aside. Reheat leftover protein in skillet and set aside. 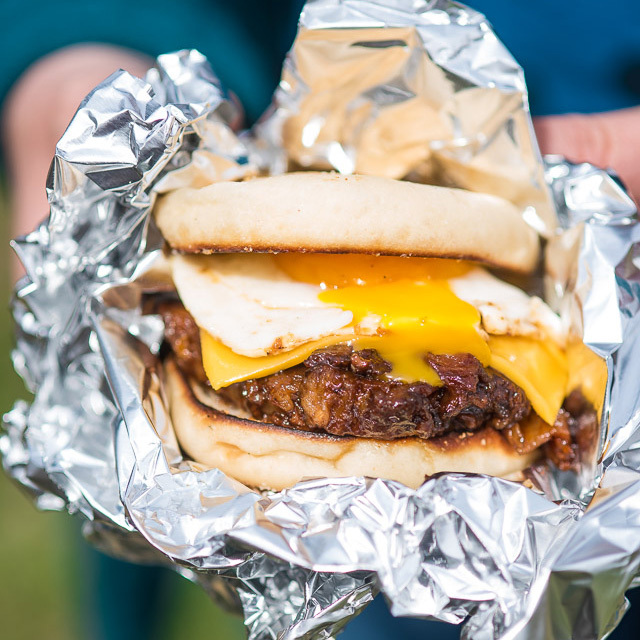 Fill english muffin with ½ cup pulled pork, runny egg and a slice of cheddar cheese. Wrap in foil and place over fire until cheese is melted. Heat the pork/protein as directed. Stir alfredo sauce into the cooked pasta with the three cheeses and enough milk to keep things loosey goosey. 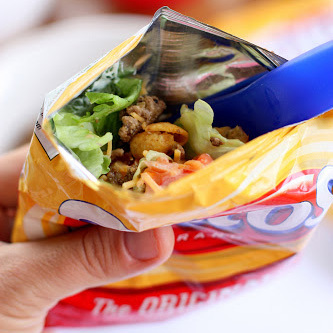 (This is so the mac and cheese doesn’t dry out while it’s staying cool.) Stir in salt and pepper to taste. Divide between four mini aluminum pie tins – or one big one – sprayed with nonstick cooking spray. 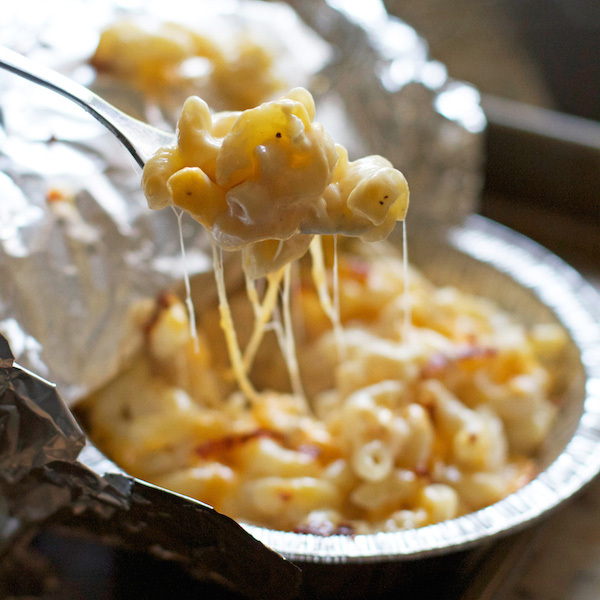 Spray one side of aluminum foil with more nonstick cooking spray and cover each individual mac and cheese portion, sprayed side down, facing the food. Seal well. Store in a large plastic food storage bag in a cooler until ready to cook. Prepare a fire and let it burn down to the coals. Place a cooking rack over top that would be 2-3 inches above. Place each pie tin over the hot coals and cook 8-10 minutes or until hot. Take a banana with its peel still on and cut it down the middle (along the concave side). Just until the tip of your knife grazes the peel on the other side. Pull the peel and banana slightly ajar and insert toppings. To cook: A controlled, even heat is what you’re looking for. 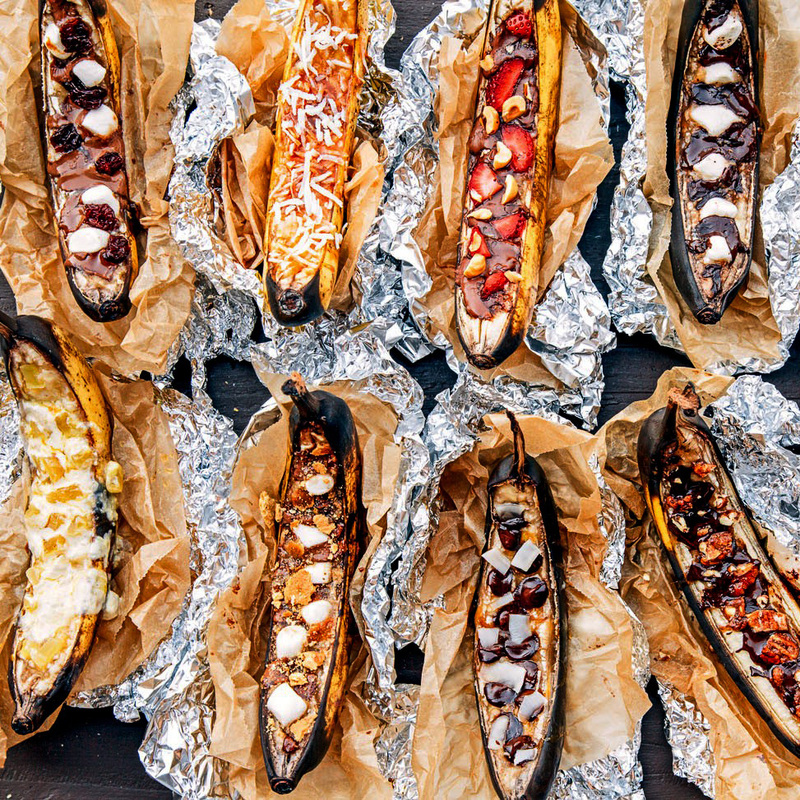 You want to warm the banana and melt the toppings, not turn the whole thing into a carbonized meteor. Remove from fire with tongs, unwrap carefully and enjoy!